I’ve been to Penticton before, and even though it is home to the Okanagan Fest of Ale – the first beer festival I ever attended – I’ve never really considered it a ‘beer town’. This past weekend I went through Penticton on my way to a wedding between good friends, and I was shown the town’s true nature as an established beer destination. My stop in Penticton wasn’t planned so I didn’t bother calling ahead to Bad Tattoo Brewing to make my presence known – I basically decided in Merritt that we should stop in to try the pizza. Sadly for me most everyone was up in Kelowna for the Hop Scotch festival, but that didn’t stop me from hanging out and having some good food and drink. Half a pint of IPA left. I preferred the stout but the IPA shouldn’t offend too greatly. 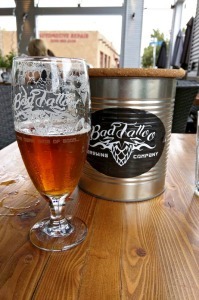 Bad Tattoo Brewing is right in downtown Penticton and about 2 blocks from the beach. They have a great patio outside to enjoy on a sunny day, which it was when I arrived. I was a bit disappointed that they didn’t have more beers available, but they are fairly new and their selection still provided all the standards you’d expect from any brewpub: a lager, a pale ale, an IPA, and a stout. They also offer a black lager if you’re so inclined. I was keen to try the black lager as well as the stout, and while the former fell a bit flat for me, I really liked the stout: it had a good body and a nice balance between chocolate and coffee. Their beer may not please everyone, but I think they have an excellent base upon which to build. And the presence of oak barrels in their brewery suggests some interesting things to come. Cannery Brewing with new patio visible. Since the welcome BBQ for the wedding was BYOB, I figured a stop at the other local breweries was in order. Until that moment I had completely forgotten that Tin Whistle Brewing was also in town so we made our way there before stopping at Cannery Brewing on the way out to Naramata. Tin Whistle Brewing recently moved their brewery to a new location, although when we arrived we had difficulty finding the entrance to the retail space and wandered into the brewery by mistake. There wasn’t much equipment set up there yet, but quite a lot of kegs and other equipment was laid about and the space was immense, allowing them plenty of room to grow. While there we got to try most of their beers except for their ESB, a rather disappointing revelation for my friend Ryan. Nonetheless, I was impressed by their Killer Bee Honey Ale and equally surprised that I’d never had it before – unless it was at an early fest of ale and I simply forgot. I’m not typically a fan of honey ales, but this one I found that I could really taste the earthiness of the specific type of dark honey that was used and not just sweetness overpowering other flavours. Naturally, I grabbed a bottle for the BBQ. Our final stop was Cannery Brewing. I’ve been a fan of Cannery since I first had their Naramata Nut Brown Ale, and I find they always make quality beer. The wedding beer was supplied by Cannery, but I knew it would likely be the Nut Brown and probably a lager, so I wanted to see what else was available. The best part about visiting a brewery yourself is that often they have beer on tap or in bottles that might not normally ship to your local pub or liquor store. 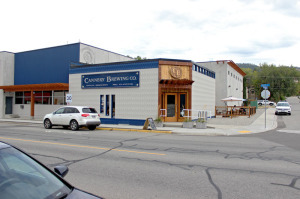 This was the case at Cannery where I got to try their Paddles Up Pale Ale, their Skaha Summer Ale (named after the lake south of town), and their Darkling Stout. 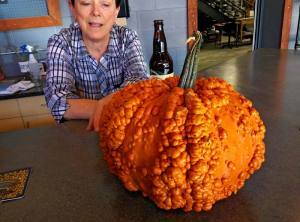 On the way out of town on Sunday I swung through again and managed to sample their Knucklehead Pumpkin Ale as well. I must say that I was well-impressed by both the Pale Ale and the Stout, but the Darkling in particular. The stout was flavourful, full-bodied, malty and just slightly bitter – all the qualities I look for in a great stout. Another plus for me was that it’s available in autumn! No waiting until mid-winter like so many breweries make us do these days. I’m not sure if you’ll find the Darkling around in bottles but if you do, I recommend you grab one. If not, I’ve heard rumours that it’ll show up as the mystery can in Cannery 12 packs in the near future. So next time you’re heading to Penticton, whether for vacation or just passing through, don’t forget that this small town also has more than its fair share of breweries to visit. Whether you visit one or all three, you’ll not be disappointed.